8 years have passed since Batman took the blame for Harvey Dent’s death to give Gotham the real hero that they deserved. During this time Bruce Wayne has become a recluse and is living his life in Wayne Manor while the Bat suit has been hung up. However when a new force comes to the city in the form of Bane, Bruce must put the suit on once again and prove to the whole city that he is the real hero. 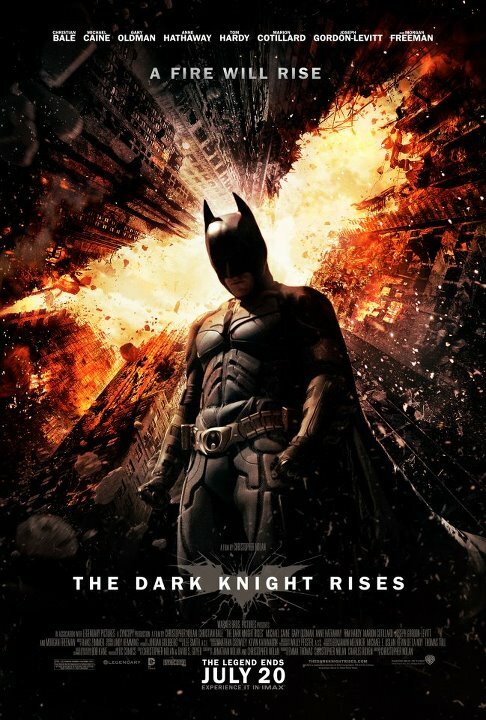 The concluding chapter to Nolan’s Batman trilogy The Dark Knight Rises (TDKR) and Batman must once again battle an enemy who is trying to take over Gotham City. Bane is the new enemy, played by the wonderful Tom Hardy, who fits very nicely into Nolan’s telling of the Batman story by keeping the character grounded in the real world and a totally different type of enemy when compared to Ledger’s Joker. Other characters added to story are Anne Hathaway’s Catwoman (although she is never called this throughout the whole film), Joseph Gordon-Levitt (JGL) playing a young cop called John Blake and Marion Cotillard playing Miranda Tate who is a business lady and Bruce Wayne’s love interest. These characters are in addition to the regulars of Gary Oldman, Michael Caine and Morgan Freeman. The film definitely has that final film feeling to it while rocking out at a massive 165 minutes with a lot of this seeming to be 1 on 1 conversations between characters. However this doesn’t detract from the amazing story that is being played out along with the fantastic camera work and the brilliant music of Hans Zimmer. Hathaway and JGL were nice additions and fitted into the trilogy easily plus Hathaway looked great in her outfit. I believe this to be a great film that gave you exactly what you wanted from the third and probably final Batman film that Nolan will be directing. Yes I think there are a lot of bits that were made for the fans and the comic book lovers but this is why I loved it. Is it better than The Dark Knight? I’m unsure. I’ve seen that film so many times I know it better than the back of my hand. I will need to see TDKR a few more times before I can give that question a proper answer. I did like the little Easter eggs and cameos in the film to give true fans a nice nod to certain themes or characters. This film was hyped up so much that I believe it has affected the way that some people have viewed the film. Some people have said that the lack of Batman fighting let the film down. What people need to realise is that Batman is technically a Detective not an all-out arse kicker so I had no problem with this side of things. Having waited for this film and jumping on the hype bandwagon I have not been disappointed by what I saw and I will definitely be making repeat viewings. Go and see this film! Christopher Nolan said that the film’s theme deals with “Pain”. For Batman Begins, it was on “Fear”, while The Dark Knight deals on “Chaos”.